OXFORD, Miss. 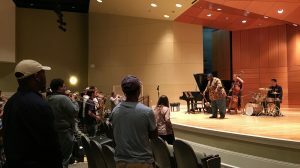 – Cyrus Chestnut, the kickoff performer in the 2017-18 Jazz Series at the Gertrude C. Ford Center for the Performing Arts, conducted a jazz clinic with University of Mississippi music majors and Oxford High School band members recently in Nutt Auditorium. Chestnut, a critically acclaimed jazz pianist, composer and producer, performed Sept. 14 at the Ford Center. The Baltimore native has recorded with many celebrated artists, including Dizzy Gillespie and Bette Midler. “Cyrus is one of the most prominent jazz pianists performing today,” said Michael Worthy, UM associate professor of music. The biggest takeaway from Chestnut’s clinic for budding musicians is the importance of training one’s ears to connect the melodies that you hear in your head with your instrument, Worthy said. During the clinic, two students were chosen to come onstage with Chestnut to play under his guidance. The lucky students were Liam Mooney, a freshman majoring in music education, and Gabriel Ackermann, a master’s student in music from Brandon. Mooney said he learned a lot from the experience and feels he is better equipped to be a jazz bass player.